I see lots of rap groups during South By Southwest, but it’s always a little more personal and special when I see the League of Extraordinary G’z. Not just because they’re Austin’s best rap group, but because I’ve been knowing them and keeping up with them ever since journalist Matt Sonzala spoke highly of them to me three or four years ago. I’ve seen them perform at South By Southwest for several years, at Conway, Arkansas and A3C in Atlanta. I’ve enjoyed their mixtapes, whether given to me or downloaded. I’ve proudly worn the T-shirts they gave me with the familiar map of Texas made out of guns (what a superb logo). I’ve felt the deep sense of loss and tragedy as they have lost not one but two members to death in the last couple of years, both from rare medical conditions. 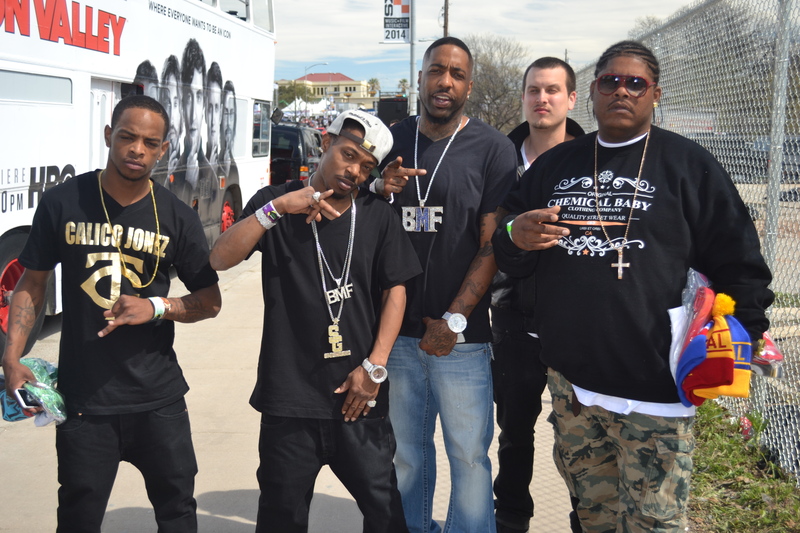 In short, the LOEG’z are not merely a rap group, but my friends and family, and I always try to catch at least one of their shows when I’m at SXSW. When they announced that the next act to come on stage would be Tanya Morgan, of course I was expecting to see a female rap artist come up. Two guys was the last thing I would have expected. But they soon made us understand that Tanya Morgan was the name of their Brooklyn-based rap group, which strangely had no female members at all, and the origin of the name remained unexplained. But they proved to be a decent New York-style hip-hop group. Sir Michael Rocks was followed on stage by Jarren Benton, a Decatur, Georgia rap artist whom I had first seen at South By Southwest 2 years ago. After I left out of the Lustre Pearl, I walked down Rainey Street to the Half Step, where Audible Treats was having a hip-hop showcase. Sir Michael Rocks of the popular rap group The Cool Kids was on stage when I got there. I walked from the Convention Center to Lustre Pearl and arrived in what I thought would be plenty of time for the Hot 8 Brass Band performance, but when I got there, nobody was being allowed in because there was already a significant crowd inside. People were allowed in as others left, but while we were still waiting in line, the band started playing. Fortunately I got inside soon afterward, but it turned out that the Hot 8 were booked alongside a comedian, which I could have done without. He was funny, to be sure, but I came to hear great New Orleans brass band music, not jokes. Still, the Hot 8 were excellent as always, and it was fun being outside in the early evening. When I left Rainey Street, I knew I had only a little bit of time to walk down to South Austin for the St. Paul and the Broken Bones show at the Hotel San Jose, but I figured I could make it if I walked quickly enough. On the way, I ran into a group of guys from Calico Jonez‘ camp. Jonez is a former Memphis rapper that like so many others decided to move to Atlanta to further his career. I think it wasn’t until my third South By Southwest that I even realized there was such a place as Rainey Street. After all, all I could ever see from Cesar Chavez Street was a big parking lot, and although I saw people walking or biking down that way, I never knew where they were headed or what was down there. But I finally discovered the quaint, isolated neighborhood with its old houses-turned-bars, and it has become one of my favorite places to go during South By Southwest. The Filter party I had RSVP’d for was at a new bar called The Container Bar, which was an architectural wonder…a bright, open space of glass and old cargo containers, transformed into a hip, trendy club unlike any I had ever been in before. The dance floor was largely outdoors, and the music largely dance/trance/techno, but it was a fun atmosphere, and I had no problem finding a place to recharge my phone either.